Mergel, I., Mugar, G., Jarrahri, M. H. (2012): Forming and norming social media adoption in the corporate sector, ACM Proceedings of the 2012 iConference, New York, NY, doi>10.1145/2132176.2132196. 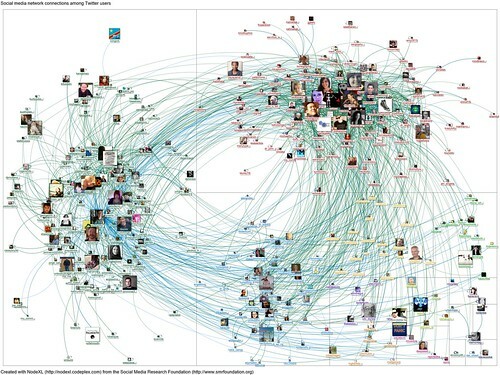 Yesterday, I created the first #FedTweets Twitter network and shared the relatively sparse initial set of connections. It included only the organizers and speakers and a few others who were talking about the webinar and advertising it to their own networks. Today, Justin Herman (Phase One Consulting), Scott Horvath (Web and Social Media Chief at USGS), Tammie Marcoullier (Program Manager Challenge.gov at GSA), and Stacey Palosky (Public Affairs Officer at U.S. Consumer Product Safety Commission) presented their insights on how they use Twitter in their agencies. The presenters encouraged the participants to heavily use the #FedTweets hashtag and keep the conversation going beyond the one hour live encounter. FedTweets_PartII, a photo by inesmergel on Flickr. Google Plus has recently added a new feature to every post: “View ripples“. Click on the drop down menu (arrow down) next to a post and look for the last menue item “view ripples”. In order for this functionality to work a post had to be shared (at least once) by other readers. 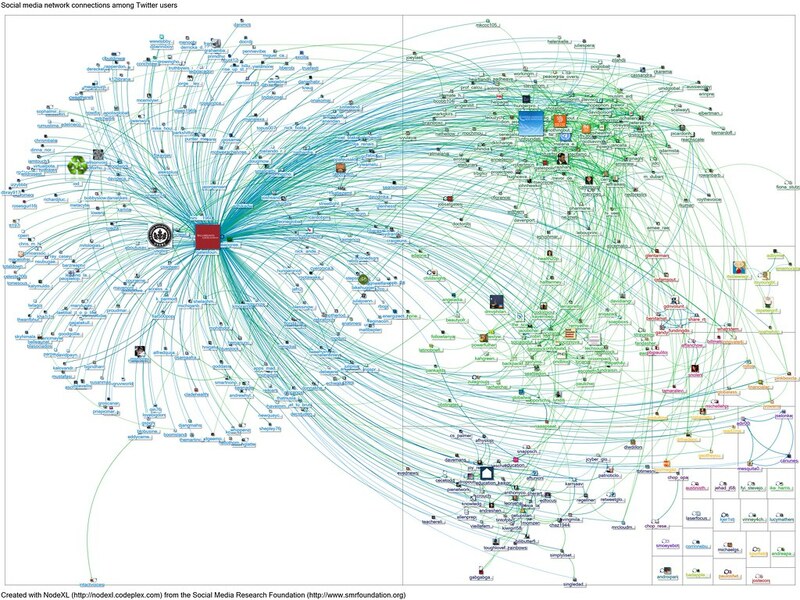 The result is an instant social network analysis: starting with the original poster as the node in the middle with his outdegree connections indicating each node who has reshared the post out to his or her own network. 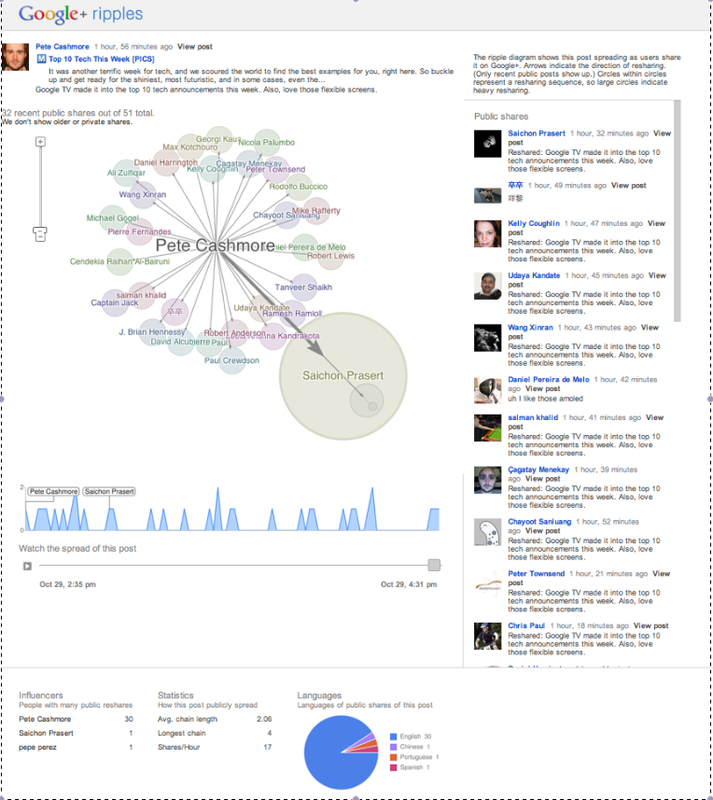 Besides the really neat network graphic, Google Plus also offers a few descriptive statistics, such as the names of those who serve as “influencers” in the network and the number of times their own repost was shared, plus a few numbers such as average (chain) path length (the number of times the post was reshared), the longest chain, and the shares/hour. Google calls the influencers in the network “sharing hubs”. The only downside I see right now is that you can’t ripple your own posts. Too bad!